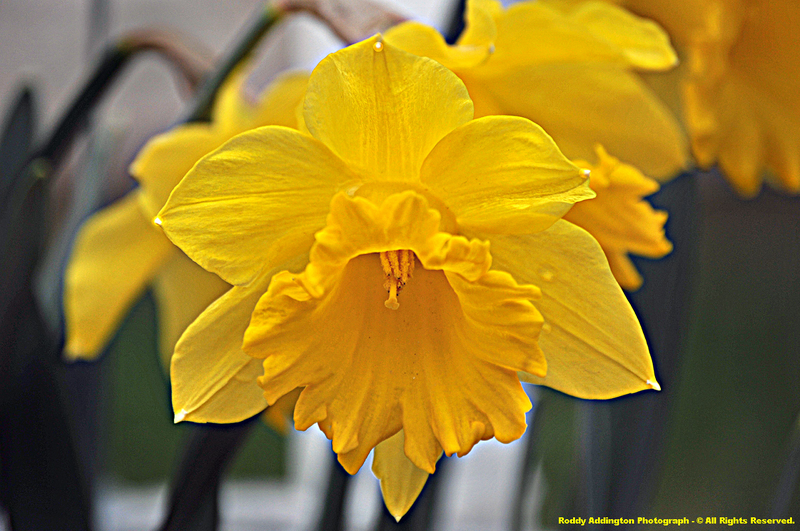 Glorious Spring Renewal & March Madness! 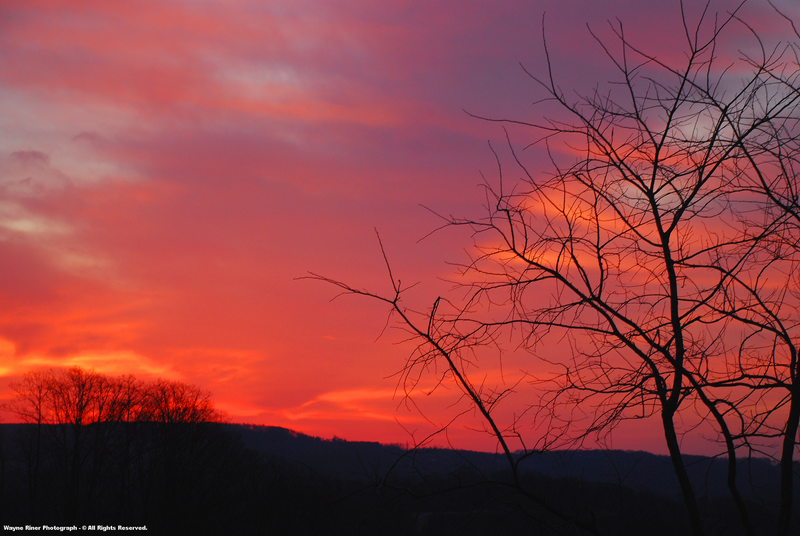 "It was the first spring morning, and it came with a welcomed blast of color. As I studied the colors with my eyes, my ears listened to the long and beautiful mating call of the Robin from the orchard below." 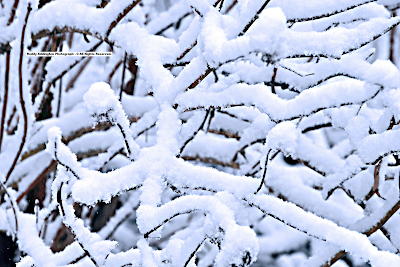 For climatological record keeping, however, the three month period of March through May is considered to be the season of spring. Following in the wake of a long winter slumber, spring is a time of rebirth and renewal. A time of glorious awakening! Perhaps no where on earth is the majesty of this special season as evident as in the Appalachians, where the richly varied landscapes of these ancient mountains are renewed by the interconnected rhythms of life ( astronomical, terrestrial & subterranean ). For many humans the process of spring renewal is exemplified by the appearance of wildflowers and the melodious singing of song birds. In such a manner the interconnected rhythms of the natural world merge, and reach forth to touch the invisible realm of the human spirit itself ( soul within )! 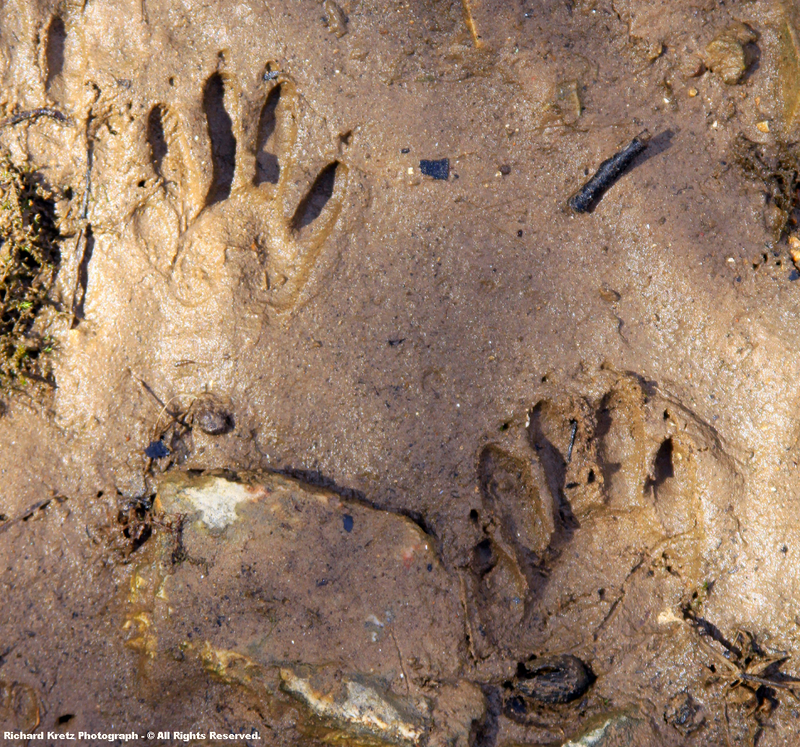 It has been said, and much scientific evidence supports, that "modern age" humans become increasingly troubled when they lose contact with the natural world around them, disrupting the interconnected rhythms which make us all part of this wondrous and complex array of Life on Earth. 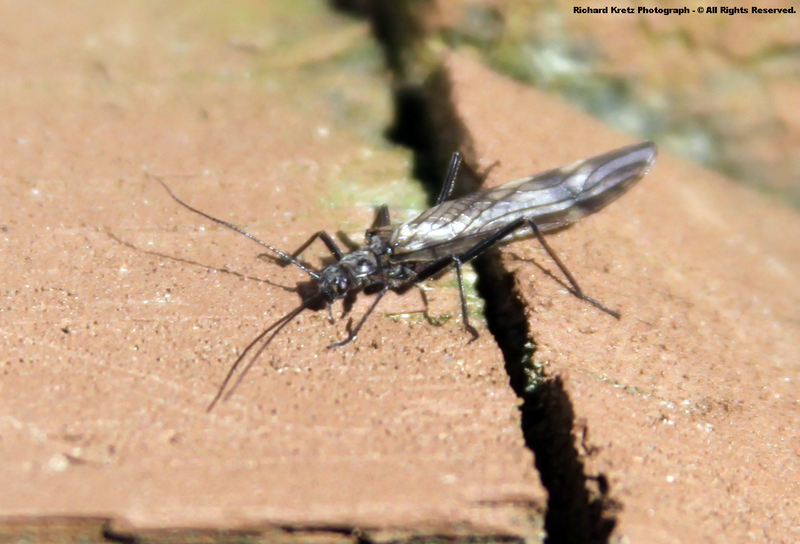 A natural world of life which, as this website strives to illustrate, includes SO VERY, VERY MUCH MORE than merely wildflowers and birds ( as grand as they truly are )! 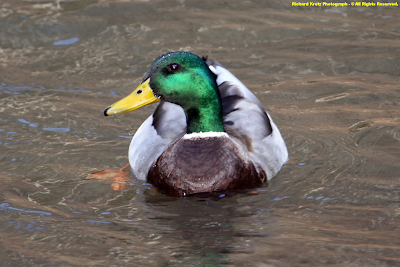 "The warmer days have brought sure signs of spring. Along with hearing the Robin’s song in early morning and late evening, Coltsfoot can be seen growing in dry, sunny spots along roadways on Long Ridge. 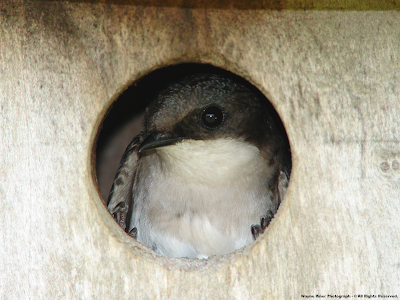 Eastern Bluebirds are looking for nest boxes, but most notable is the return of Tree Swallows from Central America. 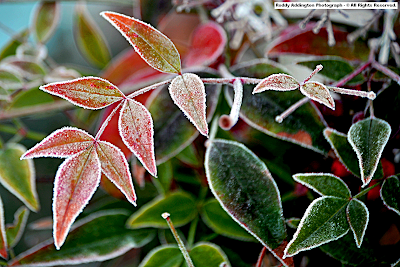 Their return being about two weeks later this year because of colder weather." 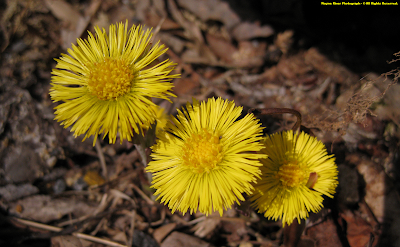 My nature journal records that the first Coltsfoot bloomed last year during early March, within the Clintwood to Long Ridge corridor of the Russell Fork Basin, with March 21 being the date observed along the High Knob Mountain Road ( Rt. 619 ). 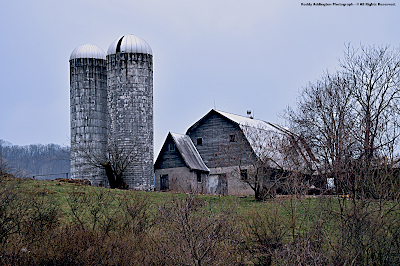 Tree Swallows were observed flying above Long Ridge by March 10th in 2009. All dates being around 2 weeks earlier than this year as my friend Wayne Riner noted. 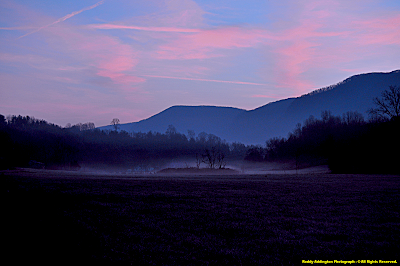 Spring in the southern Appalachians is like few places on planet Earth, as a truly vast and magnificent diversity of life forms emerge from winter slumber to join migrating multitudes amid this most wondrous season of change! The beautiful Scarlet Cup mushroom is one of the first to appear in spring. 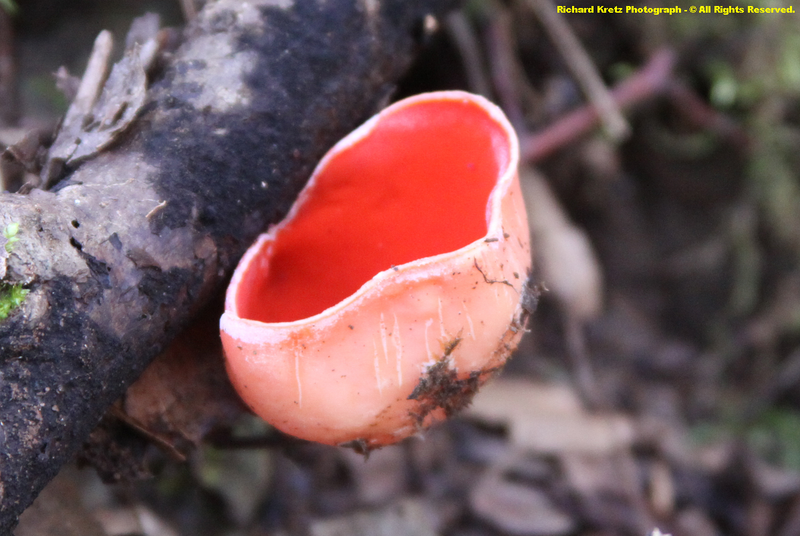 It is of the Ascomycota phylum, and is a saprobic fungi which does a great service by helping to decompose already dead wood ( i.e., it does not attack living wood and is therefore not parasitic like MANY fungi ). early April on average ( during the past decade ). I have always found it difficult to take a good photograph of these early bloomers, unlike my talented friend Richard Kretz! of the Clinch River Valley. 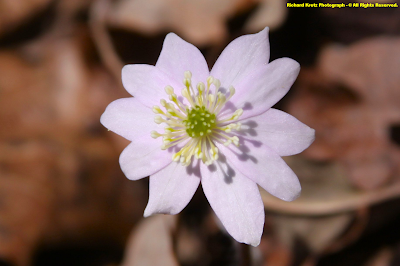 ( Hepatica americana ) tends to be more typical of soils derived from acid based stratigraphy ( the most widespread species in Virginia since acid based rocks are most common ). They are also called Liverworts, and may not bloom until late April or early May amid higher, colder sections of the High Knob Massif ( especially during cooler springs ). 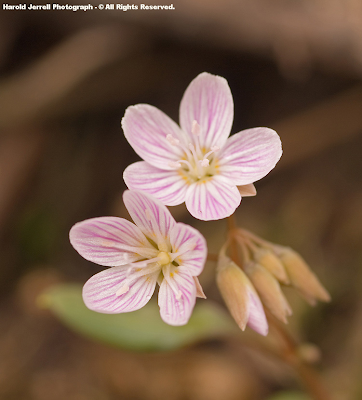 In the High Knob Landform where calcareous and acid-based stratigraphy are well mixed, these preferences will often dictate which species of hepatica grows where. In the High Knob Massif, in particular, where many slopes contain both rock types, it is not uncommon to find both species of hepatica growing at different elevations. A rather ironic twist, since in this case the variation in species type is being controlled more by stratigraphy than by influences of sheer elevation itself. The ability of light to pass unfiltered through the forest canopy is simply vital to the emergence of the kind of magnificent, woodland wildflowers for which the Appalachians are most famous. 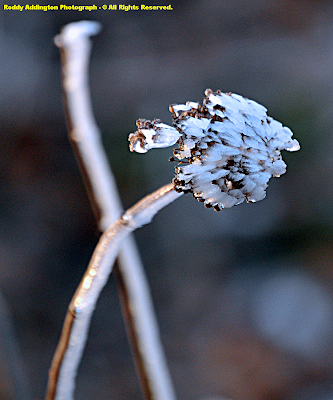 Ephemeral meaning short-lived, or transitory. 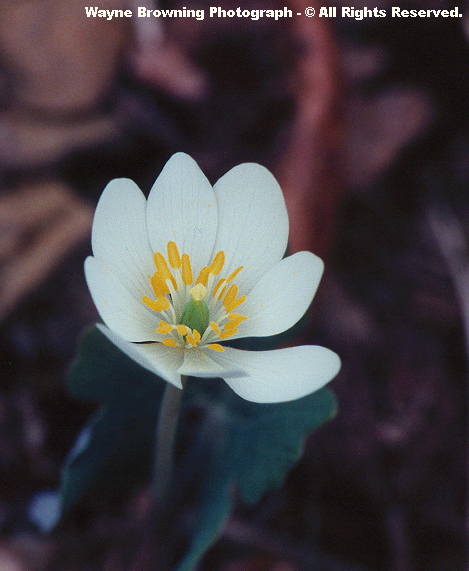 Bloodroot is a nice example of a spring ephemeral that possesses a relatively short blooming time for individual plants. 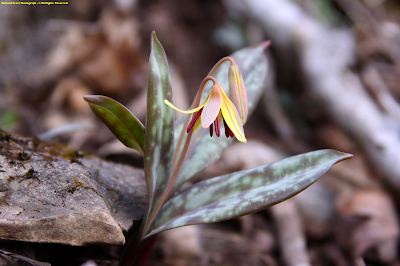 They typically bloom during late March and especially April within the High Knob Landform, while cold weather and snow is still observed. 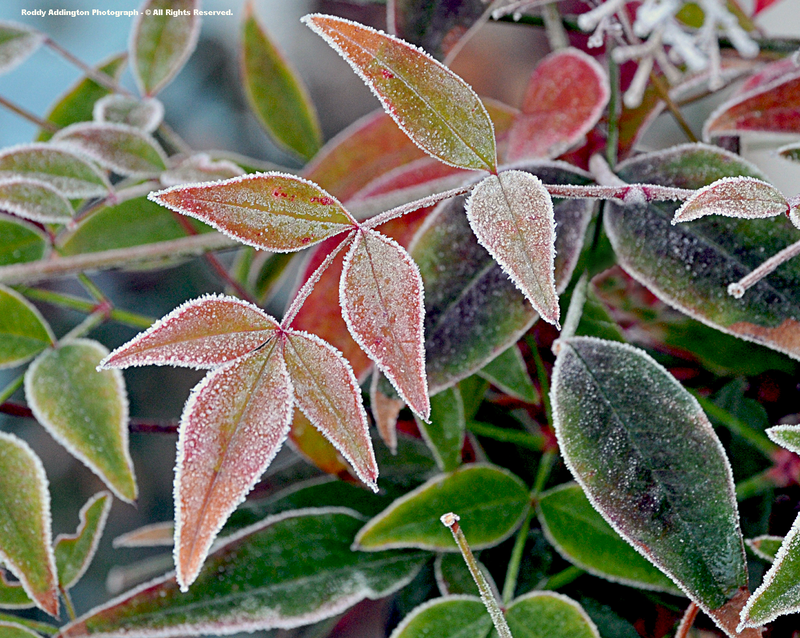 The distinctive leaf above often wrapping around young plants like a little blanket. In a sense the term ephemeral is correct in that the flowers or blooms of each plant do last for only a short time. However, most of the herbaceous wildflowers of spring are actually perennials. A perennial plant being one that persists from year to year. Most of these hardy beauties ride out the cold season underground, invisible to the above ground observer as bulbs, corms, and rhizomes. These are all just storage organs where complex carbohydrates, like starch, wait anxiously for the right astronomical & atmospheric signals that flowering time is at hand. It is really quite ingenious! Bird's-eye Speedwell is not a native wildflower. It is one of many introduced species of Veronica which have spread across the landscape. 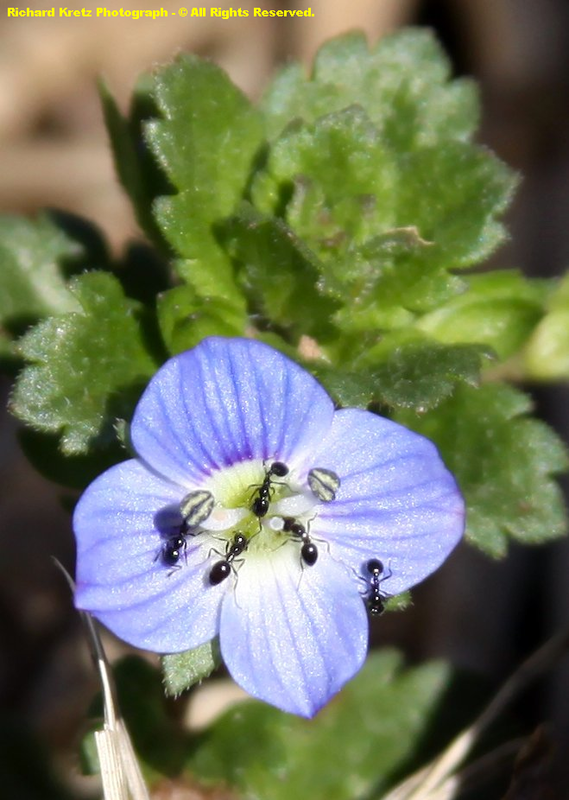 The American Speedwell ( Veronica americana ) is one of only a few which are native in this genus. However as busy ants above illustrate, whether for good or bad, it fills ecological niches that are exploited by many species. of the slumbering beauties to be! Storage organs rich with hidden energy that is locked away in the chemical chains of multitudes of complex carbohydrate molecules. With one final added ingredient, water, the assault begins and complex carbohydrates in storage are broken down into usable forms of energy. 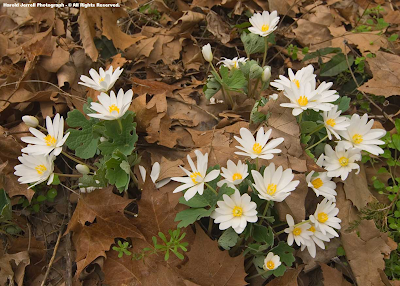 Growth begins and a precession of spring ephemerals magically break through the leaf litter across a light filled forest floor to transform the landscape from muted to magnificent! However, it actually is even more wondrous! Spring Beauty is a true harbinger of the new season and ideal example of a native ephemeral with rich, tuber-like storage organs from which they renew themselves. Each comes in its own time, according to its own unique genetic programming! Like the combination of a safe, a precise mixture of light, temperature, and moisture is required by each species before the genetic program embedded within will recognize that its time to open the doorway to growth & flowering. 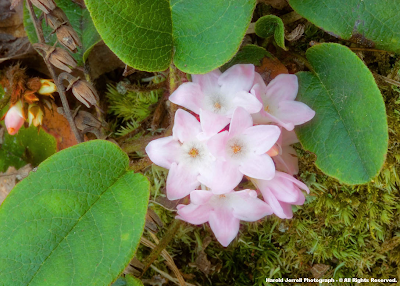 Trailing Arbutus actually falls into the classification of a low growing evergreen sub-shrub, but it is also one of the first lovely wildflowers to bloom in spring. Blooming times varying with elevation and exposure ( of course ). In this way, flowering times for individuals of the same species vary across the mountains as light, temperature, and moisture varies across the complex terrain itself. 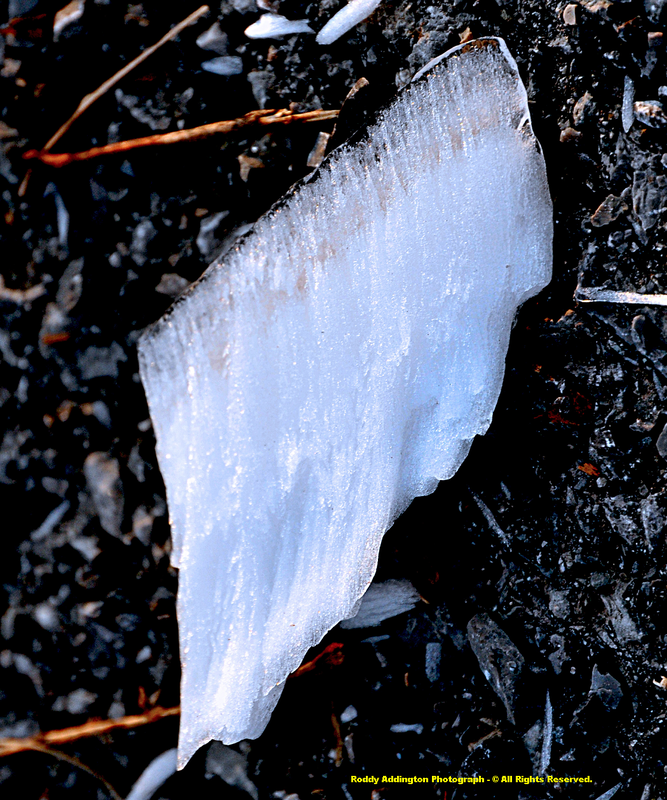 It is also in this way that species favoring less light, more light, lower temperatures, higher temps, less moisture, more moisture, and specific chemicals weathered from specific soil types are ultimately constrained by an intimate mix of environmental parameters and genetics to favored sites across the landscape. is it not truly just wondrous! 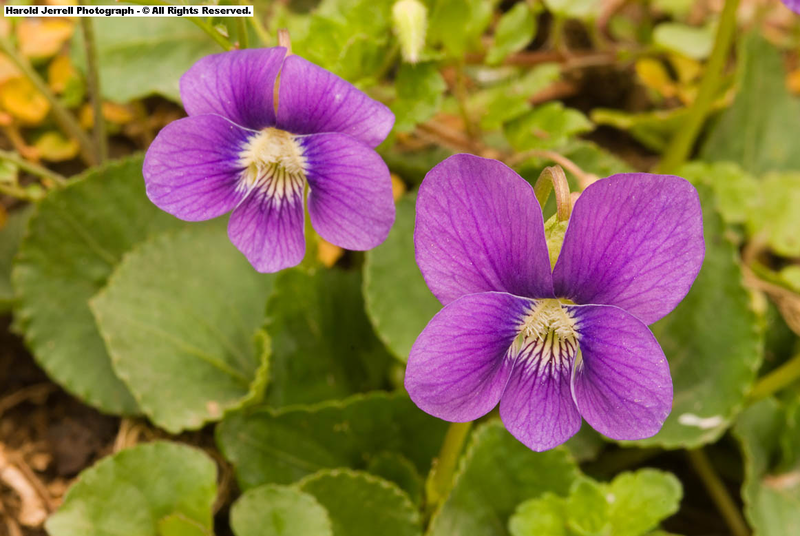 More than two dozen species of violets grow within the area, with identification of specific species often made more difficult by their tendency to hybridize. ( essentially the only mechanism of energy input into the living world ). ( with removal of electrons & release of oxygen as a by-product ) and a reduction of carbon dioxide ( yielding formation of organic compounds such as carbohydrates ). Photosynthesis produces the carbohydrates that make up the storage organs which are then used later to renew the process all over again! 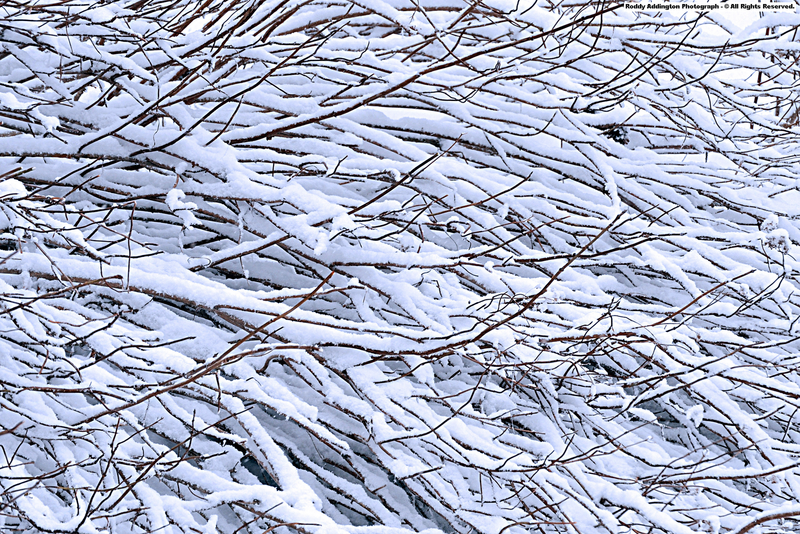 By this process, in the BIG picture, planet Earth literally breathes IN and OUT with incredible synchrony! Upward spikes in this chart being due to winter respiration of the Northern Hemisphere, with it literally letting out an enormous breath enriched with carbon dioxide as its ecosystems go dormant and photosynthesis diminishes. 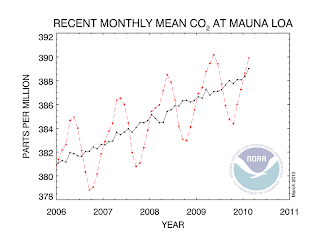 The downward spikes in the chart above, by contrast, being caused by summer photosynthesis of the Northern Hemisphere as its ecosystems come alive and breathe in more carbon dioxide than they respire ( breathe out ). 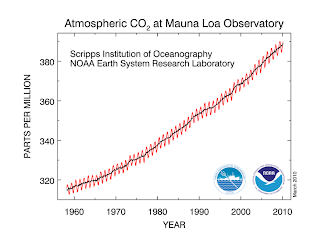 The problem, of course, with the above charts being the steady, well documented rise of mean CO2 concentration over time since recording first began during the 1950s ( a subject for another day ). 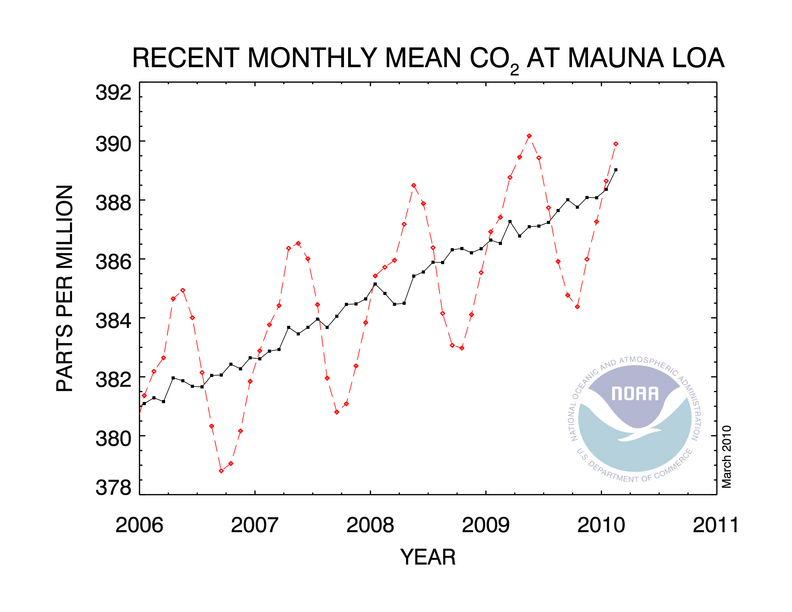 Is this steady CO2 rise truly a problem given its small mass per unit volume in the total atmospheric mixture of gases? In reality, it is only a trace gas amid any given volumne. You are free to make up your own mind! 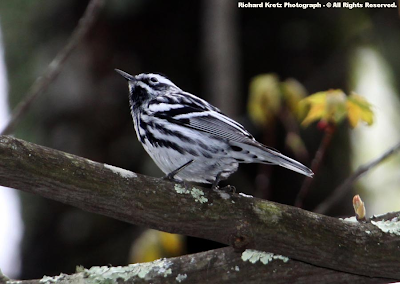 Black-and-White Warblers will be among the first of our beloved warbler troop to return, and should be listened and watched for into early April. UPDATE: I heard the first Black-and-White Warbler on March 29 ( of 2010 ) in the Clintwood area of the Russell Fork Basin. Expect an increase in neotropical migration as winds turn S to SSW from the Gulf of Mexico & Caribbean during early April. The main purpose for showing the above charts now being to illustrate that the Rhythms of Life associated with our simply wondrous Appalachian rebirth can literally be seen by the breathing of planet Earth herself! What may seem as only happening in your backyard, across the High Knob Landform, the Upper Tennessee River Basin, or the Appalachians is ALL connected in ways which are only beginning to be understood. But make no mistake, everything in the natural world is intimately connected and interconnected, from above, on, and below the surfaces of planet Earth outward into the cosmos itself ( even though we still do not yet fully understand how its all linked, to be absolutely honest and sincere from a scientific perspective ). Mallards are spring and fall migrants into the area, and according to Dr. Richard Peake can be both summer and winter visitors that occasionally breed ( the status of this species in the wild, being complicated by feral local ducks ). This sleepy little Screech Owl is a fairly common resident of the mountain area, with its eerie calls being a treat to hear on dark and gloomy nights ( as well as starry ones too )!! I just love these little fellows! 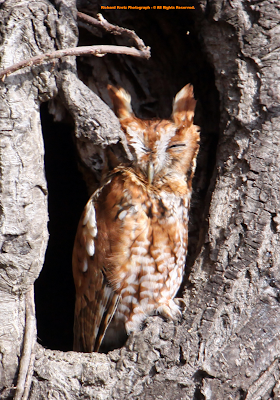 in the eastern United States with ear tufts. Some nights this little owl may be looking down at one of the two common skunk species in the area, whose tracks Richard captured above. The other species being the Eastern Spotted Skunk ( Spilogale putorius ). Spring Stonefly is of the order of insects named Plecoptera and, like Mayflies, its presence in a stream, pond, or lake is typically an indicator of good water quality. The Cedars Millipede ( Brachoria cedra ) is endemic to the High Knob Landform and known only from Lee County and the High Knob Massif area of Wise County. 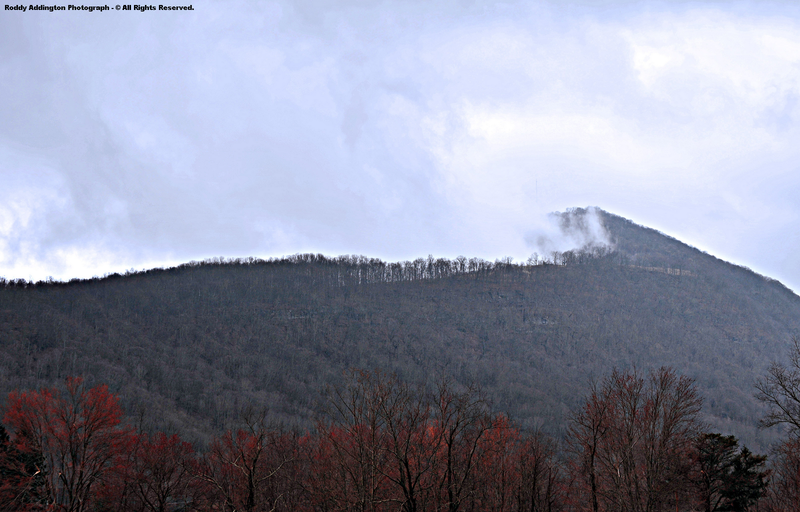 Field research by Dr. Paul Marek has been so significant that a revision of the genus Brachoria has now been made, with much of the research centered within the High Knob Landform. 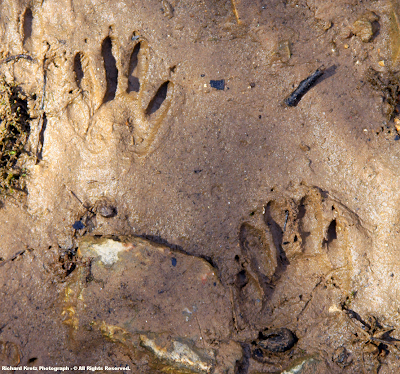 Much more will be presented about these amazing creatures and Dr. Marek's research in future editions of this website. 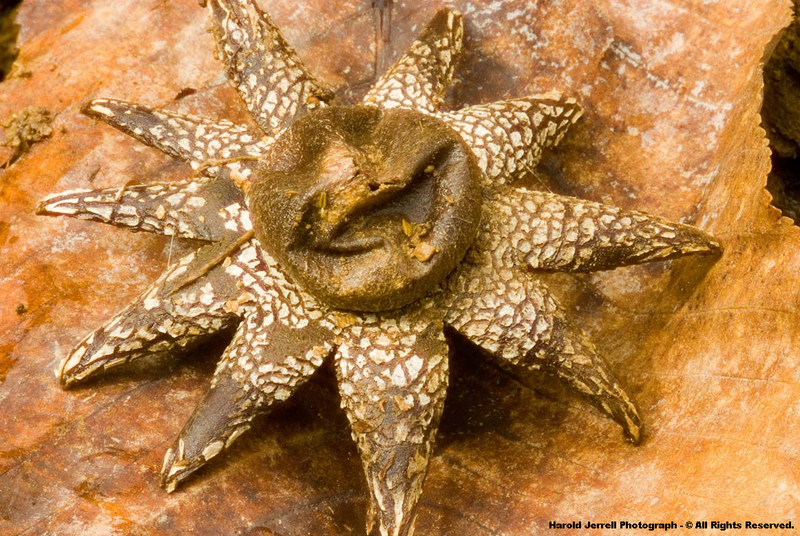 It is about time for Earthstar Fungi to begin appearing within mountain forests of the great High Knob Landform. These mushrooms are named for the unique way in which their outer spore body wall splits into an amazing star shape. 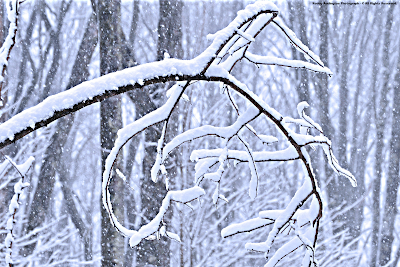 Some March's are ruled by Ole Man Winter, some by winds of Spring, and others like March 2010 by a continuous back and forth struggle between the seasons! 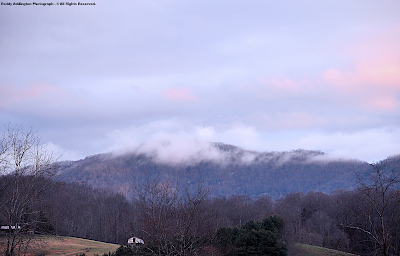 Certain days ( like March 22 of 2010 ) can have both wrapped up into one, with winds of change showing themselves early as morning cloud bases lowered across upper elevations of the massif. 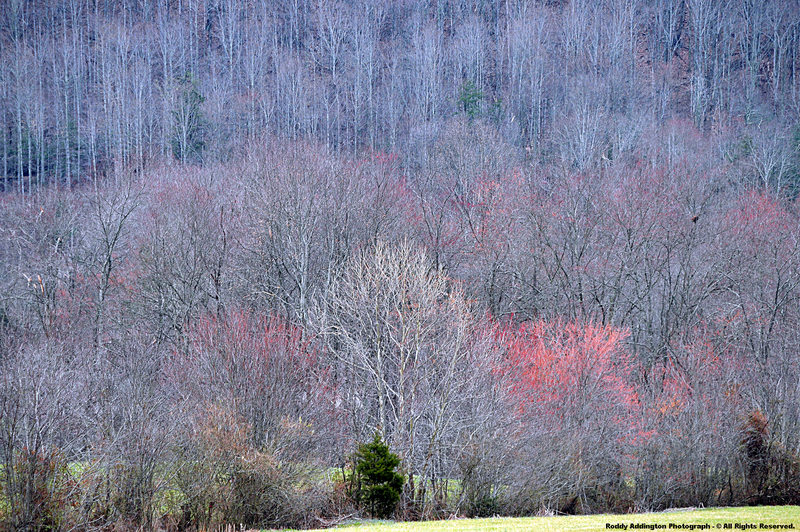 Far beneath the high country, upon the floor of Powell Valley, beautiuful colors of budding maples stood out against other dormant trees. 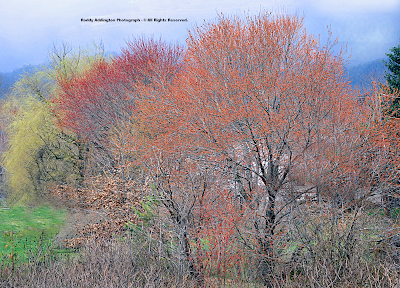 Maples & Willows ( Salix spp. ) 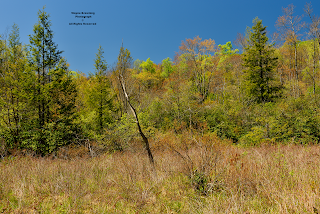 are typically among the first trees to emerge from winter dormancy each spring, with 8 different species of maple and 10 different species of willow having been documented in the High Knob Landform. The Beauty of Early Spring is refreshing! 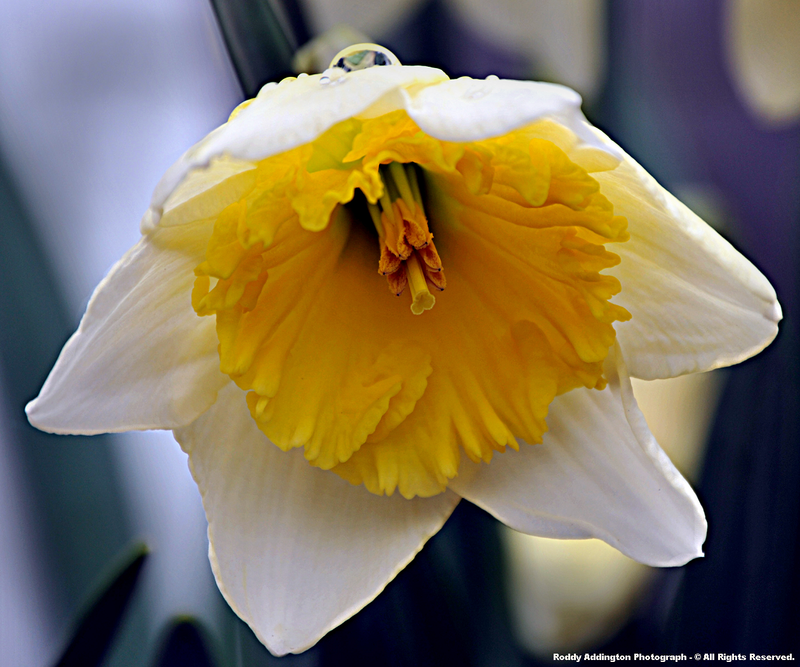 ( Narcissus poeticus ) being best known across the High Knob Landform. 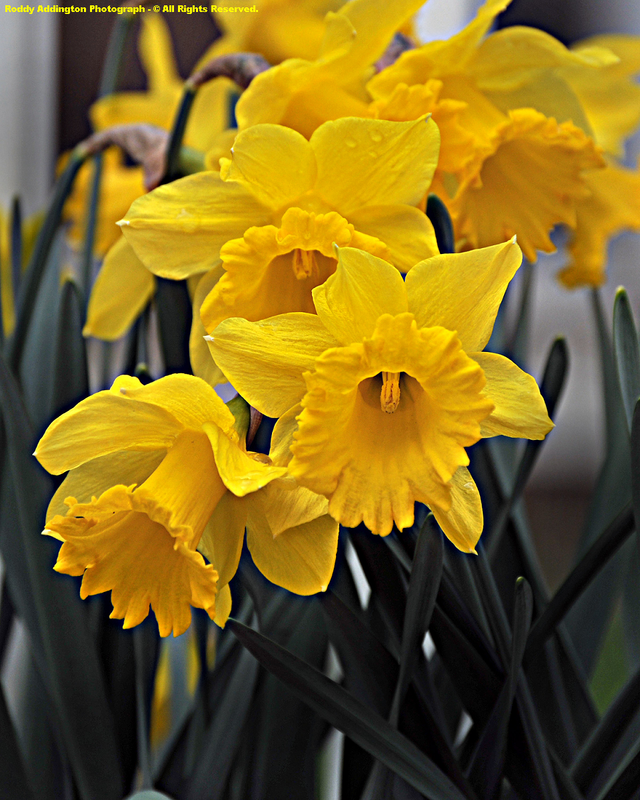 According to the American Daffodil Society there are 13 divisions of these famed flowers, with years of cross breeding having generated many variations in shapes, sizes, and colors. A burst of moderate to heavy afternoon snow quickly covered the High Knob highcountry during March 22, with State Route 619 even becoming slick eventually ( along with many others above 3000 feet ). 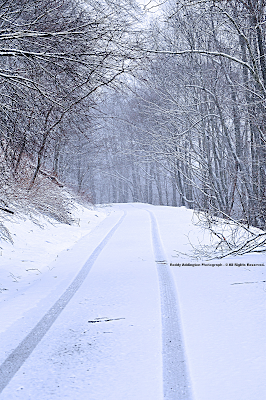 Snow has never completely left the massif without any traces since the great Mega-Dump Snowstorm of December 18, 2009 ( with its 2-3 feet of depth ). A long strip of deep snow could be seen from far away along scenic State Route 619, between High Knob and Camp Rock, despite a morning sun glare during March 20. 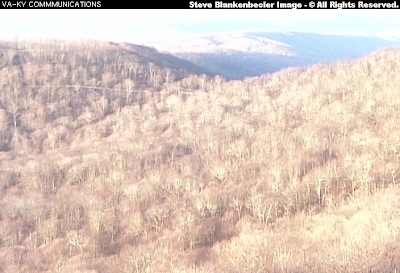 The brisk snowfall of March 22 coated the still dormant vegetation of the High Knob Massif like mid winter, as the Ole Man at least temporarily reclaimed his domain on this second full day removed from the start of astronomical spring! 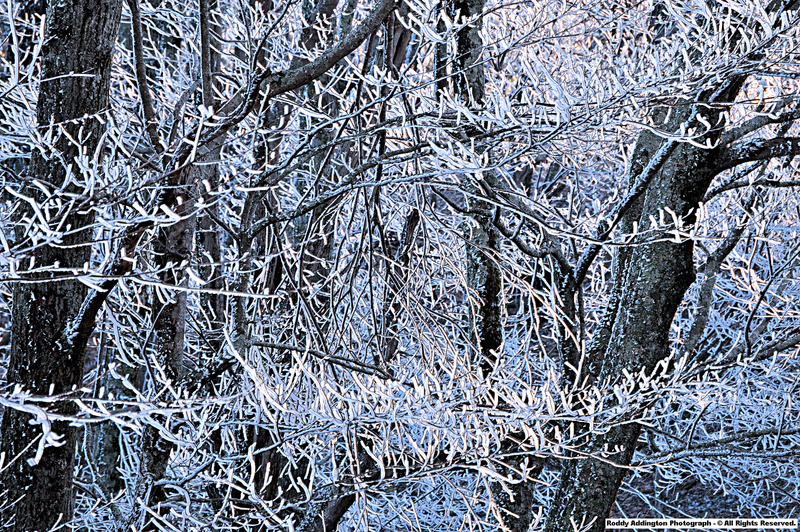 Even following a long, harsh winter, one has to admit that this snowfall created majestic scenes within the High Knob Massif ( as always captured beautifully by my friend Roddy Addington ). An initial glance at the above photograph might suggest the evergreen, well known Christmas Fern ( Polystichum acrostichoides ), but it is not the only fern species to remain mostly green through the cold season in these mountains. 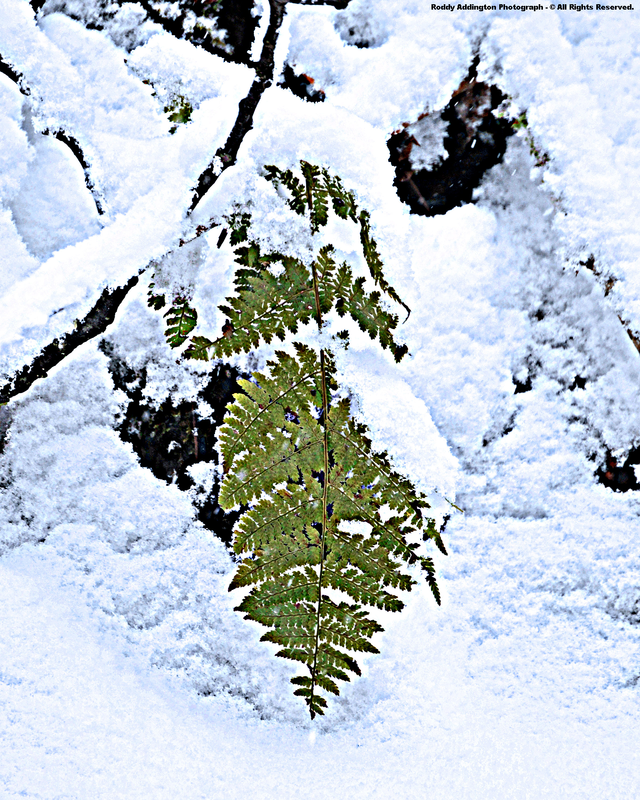 Dryopteris intermedia ( * ). 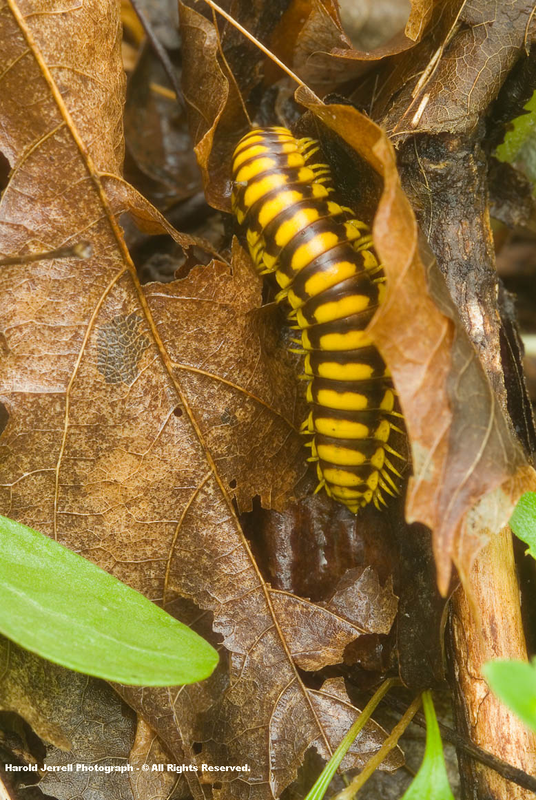 *This is why its so important to always list the scientific name when introducing a species of flora or fauna, since common names often vary greatly between regions! 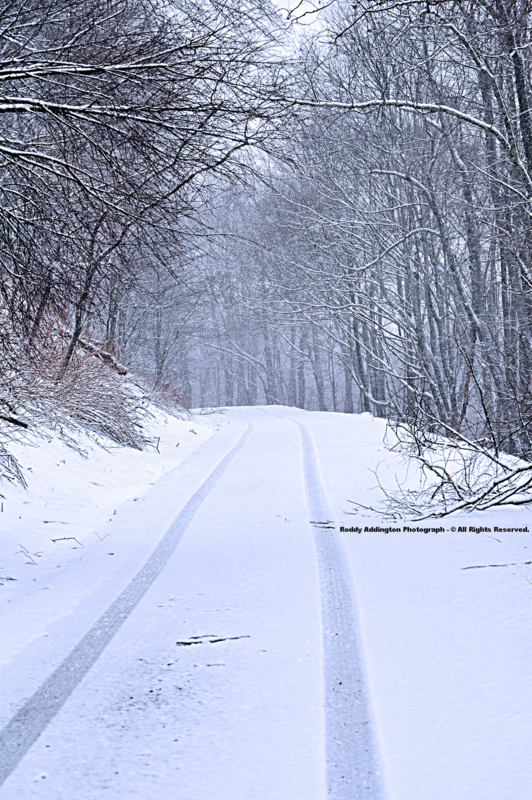 Snow covered mid-upper elevations of Wise & Dickenson counties at least some during March 22, in contrast to lower elevations ( below 2000 feet ) where only a rain-snow mix occurred. Snow depths in the view above vary from more than 4" on the left side of the steps to less than 1" within wind exposed sections via air blowing from right to left across this scene. 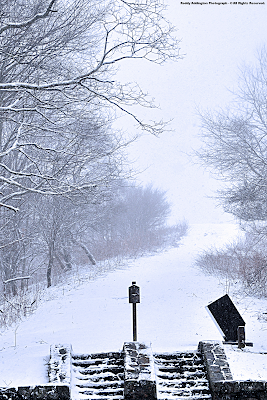 Snow accumulations across the High Knob Massif were most significant, with ground depths varying from less than 1" over some graveled and wind swept surfaces to more than 6" in drifts. 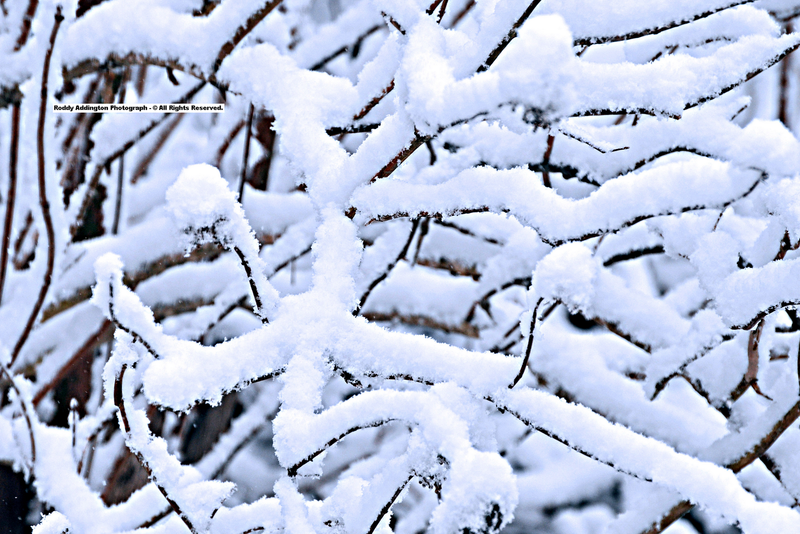 3" and 4" of total snowfall at higher elevations. Darlene & Joe Fields measured 2" of ground depth in High Chaparral, at 3300 feet elevation, to make 10.0" of snowfall during March and 124.0" during the 2009-10 season. 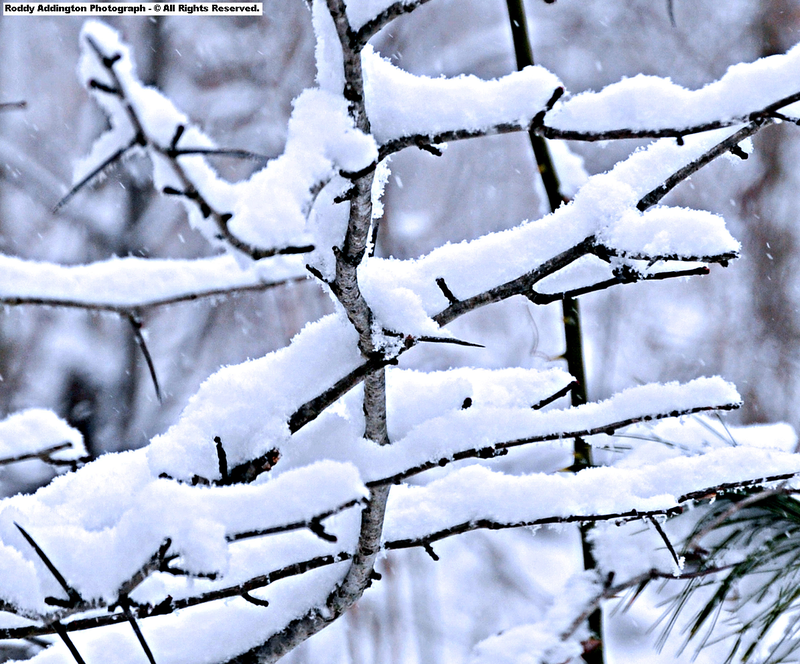 March snowfall totals reached approximately 15"
winter tallies reached the 150-200" range. Low clouds held tough through much of March 23 which featured unseasonably cold conditions. 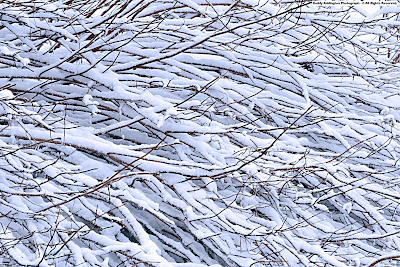 Solid snow continued to blanket highest elevations into March 24.
seen on NASA Imagery during March 23. Note in the image above, how rippling mountain generated wave clouds extend from Dickenson and Wise counties southward into Tennessee & North Carolina. on March 24 as blue mountain walls of the high country surrounding High Knob towered above Powell Valley in Wise County. 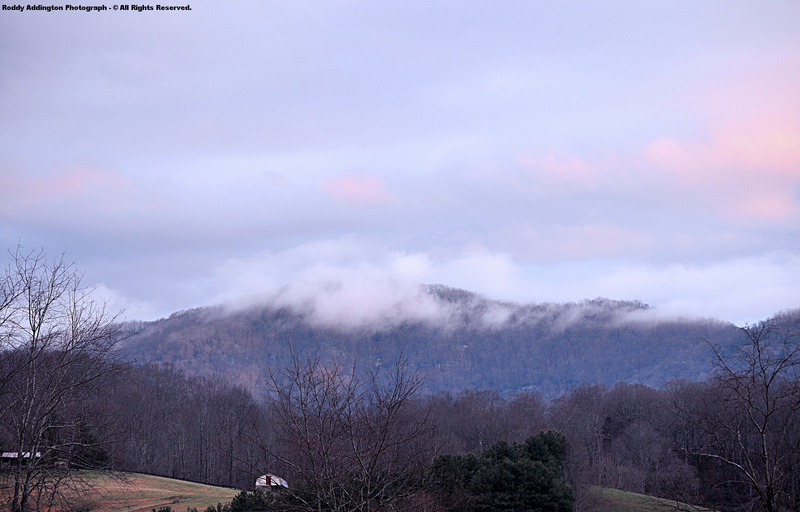 The above foreshadowing the next weather system which spread rain and wind across the mountains by late on March 25. Another blast of unseasonable, winter cold followed during March 26 when ICY clouds and even more snowflakes engulfed the High Knob Massif. 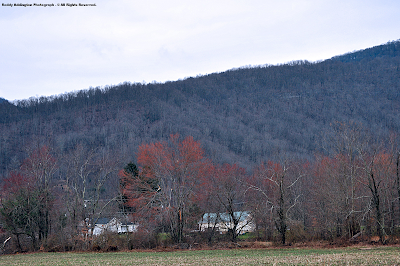 In fact, afternoon temperatures plunged into upper 20s all the way downward to elevations of Norton & Wise. This set the stage for temps to bottom out in the 10s to lower 20s by dawn on March 27 in colder mountain valleys ( above 1500 feet ). 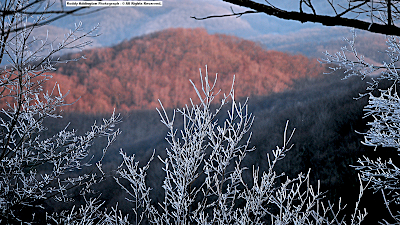 The unseasonable cold of March 26 generated an array of simply gorgeous rime formations across the High Knob Massif with an icy fog and temps in the 20s during the afternoon. 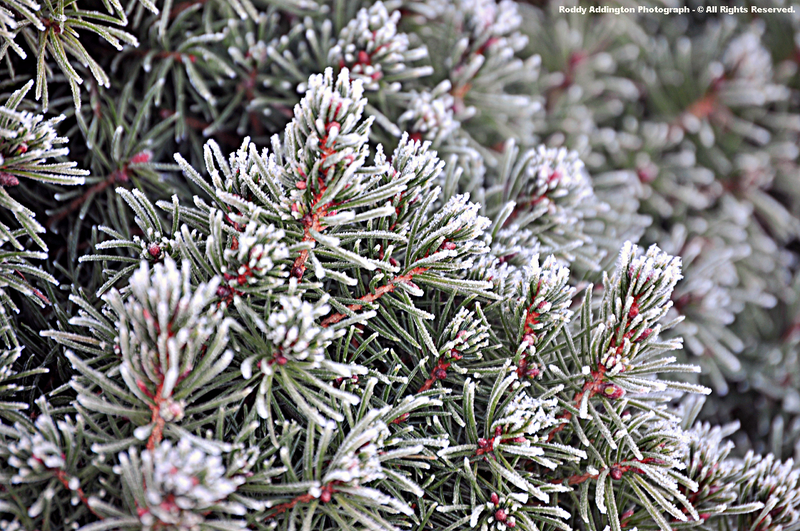 Bitter temperatures into morning hours of March 27, with clearing skies, added hoar frost to the display! 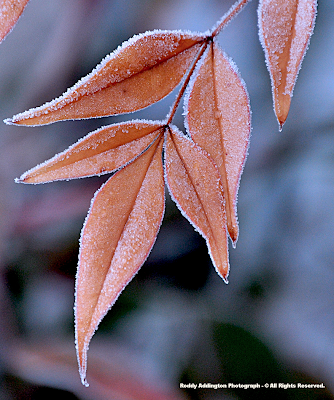 This was documented once again by stunning photographs of my friend Roddy Addington, who at this point has been photographing rime within the massif for almost 7 consecutive months! What an awesome job Rod! 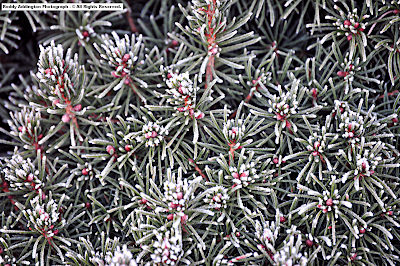 Rime has been covered hard on this website since October 2009 in order to visually illustrate to everyone what a significant aspect of the climate this is to the High Knob highcountry. 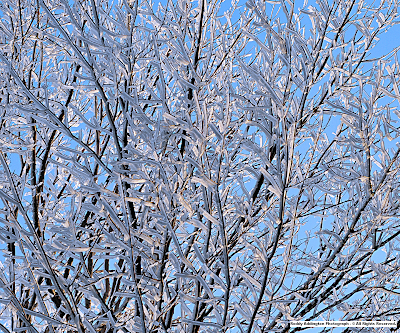 RIME desposition on TREES is a major secondary moisture source for the High Knob Massif, with subsequent rime drop from the trees supplying moisture to snowpacks and bare ground alike. 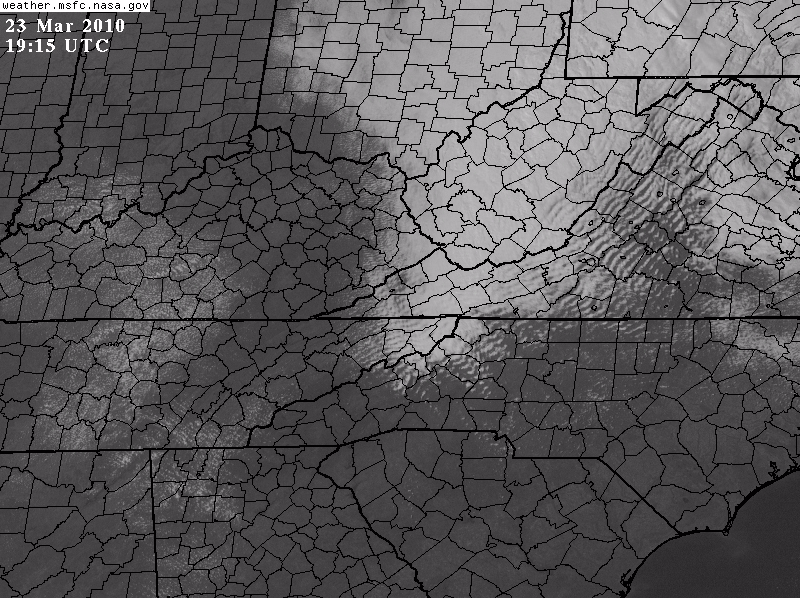 A key point, being that massive capture of this cloud vapor would not occur without trees! A single block of wind swirled rime lies on the ground below, having fallen off the trees, ready to melt and release its water with rising temperatures. 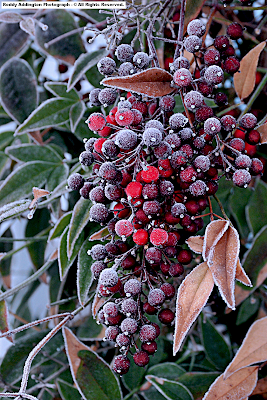 How many times since October have weed umbels been seen standing like jewels sculptured by rime? This pure beauty never fails to simply amaze! 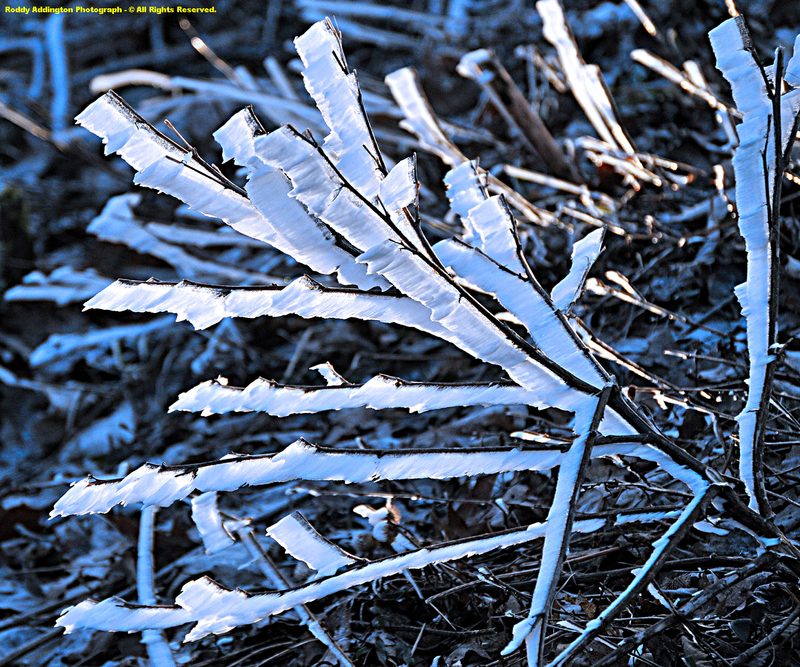 Beneath the rime zone, and lofty windward facing crestlines, frigid temperatures into morning hours of March 27 ( with 10s to around 20 degrees in colder basins and high valleys ) combined with lingering low-level moisture to produce beautiful formations of hoar frost! 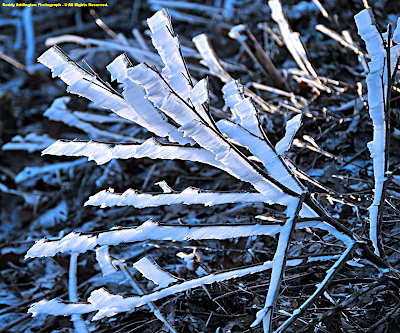 Hoar frost decorated remnant weed stems, semi-evergreen & evergreen leaves alike, with stunning majesty! Lost Creek from the high country. 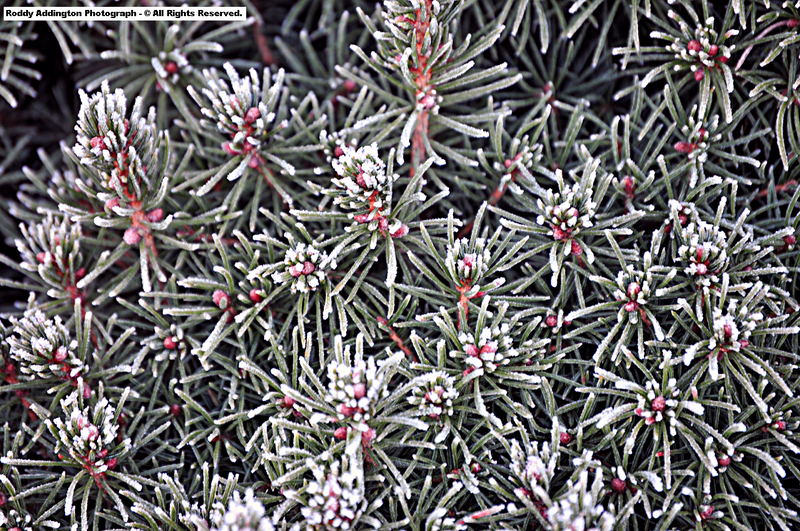 Leaves with larger surface areas have to be tough to endure such cold, unlike more hardy evergreen needles. Some scenes painted by Mother Nature appeared nearly abstract, as hoar frost coated leaves in clear focus varied with blurred hues of multi-color in the background. Awesome! 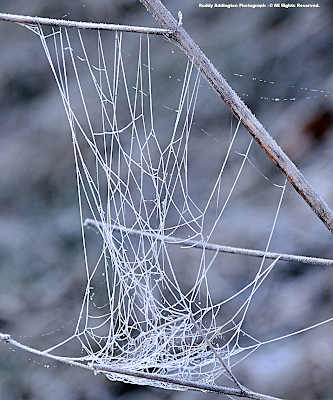 A hoar frost coated web hanging between weed stems generated an amazing morning display with web fibers enlarged to look much like strings! Scenic farms amid the Powell River Valley are often oblivious to all this deep snow, heavy rime, and hoar frost formations within the nearby highcountry ( although many were heavily frost coated on this cold morning )! 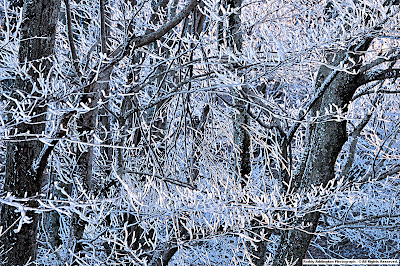 Before I began writing about RIME and highlighting aspects of my past research in the High Knob Massif on it, and Roddy began to document its nature with stunning photography, most folks in this region were unaware of rime and its significance ( as well as fog drip, hoar frost, and aspects associated with orographic forcing & condensation processes ). I would like to thank everyone for their interest in this truly amazing climatic aspect of the High Knob Landform! 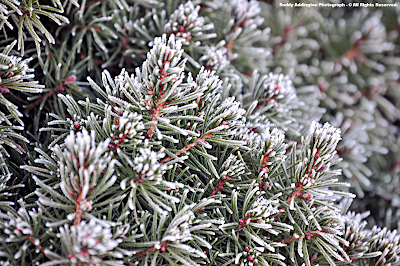 December Starts Frosty, Wild & Squirrely! 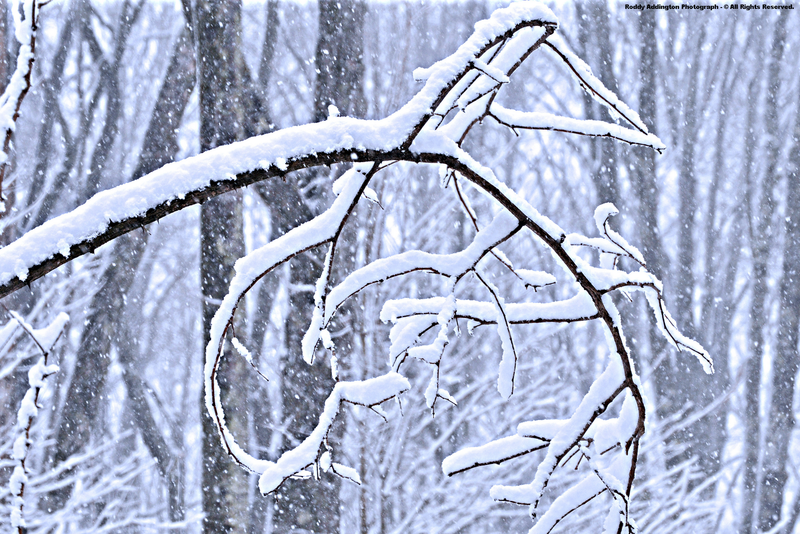 Remember, rime represents the visual extraction of frozen clouds of water vapor from the air as it is forced to rise across the great High Knob Massif, with deposition upon trees & vegetation. 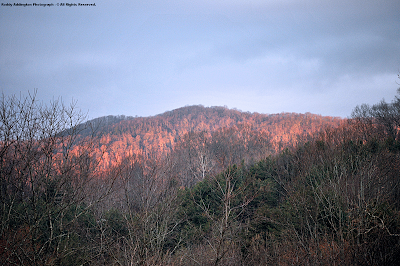 enriches their water contents, further supporting the vast diversity of life forms present in and downstream of this remnant high country of the High Knob Landform and Upper Tennessee River Basin. Rime is one of the important links supporting the chain of life and its interconnected rhythms, highlighted during this update and throughout this website ( * ). 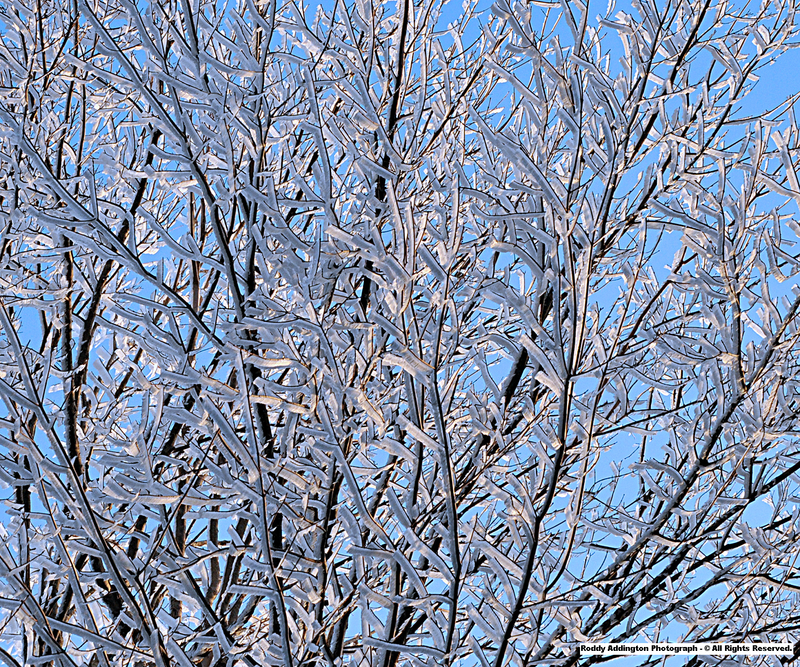 *Benefits of RIME would be impossible without TREES. 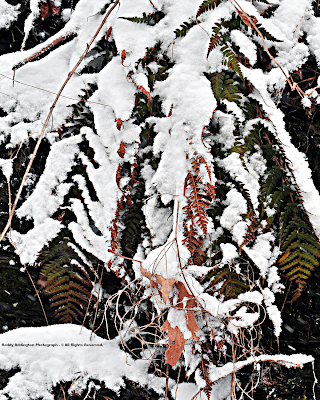 March 2010: Second Week - Spring Prelude!